After breakfast we drove to the “big” Tsingy. It is a really an amazing place. We had about a 4 hour walk there, which sometimes was quite demanding, because it was hot, the rocks were sharp and sometimes the trail was steep. There were ladders, rocks bolted to cliff sides for steps and hanging bridges. Sometimes we needed to use safety harnesses and karabiners to anchor. The views from the rocks were overwhelming. 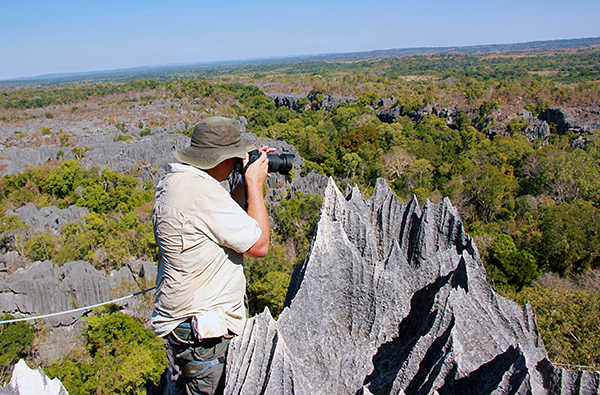 We could admire panoramic view of Tsingy with their sharp edges, and forest around the rocks where lemurs live. During that trip we also could choose between three levels of difficulty, but most of the people took the most demanding route and they were happy with it! We also had a bag lunch in the Park. After we got back to the hotel we had some free time, which we could use for final packing, because we were leaving the next day. During free time there was a possibility to go for a night walk in the National Park to watch nocturnal animals. Then we had dinner and we were supposed to have a closing party, but people were tired and left to their rooms really early, only small group of the participants stayed for some time in the restaurant and by the swimming pool, celebrating last moments of the Conference. Next day we visited one of the highlights of the trip -big Tsingy. Google Maps. 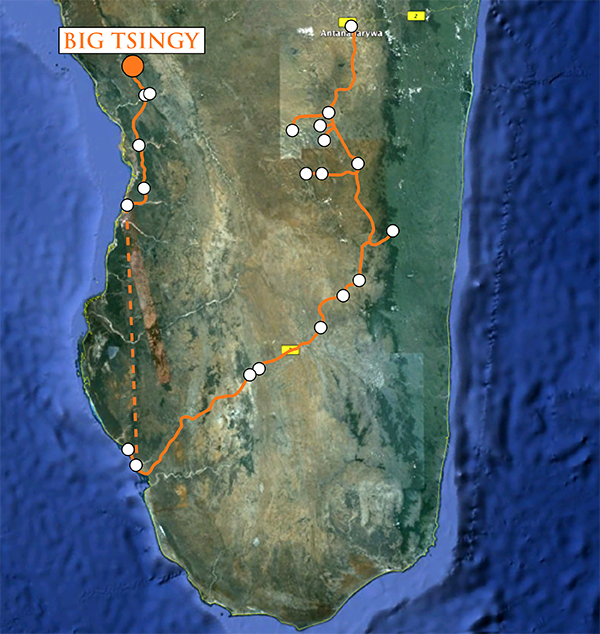 On the way to big Tsingy. M. Ng photo. Dangerous fruits, they love to leave their spikes in your body :-). M. Ng photo. 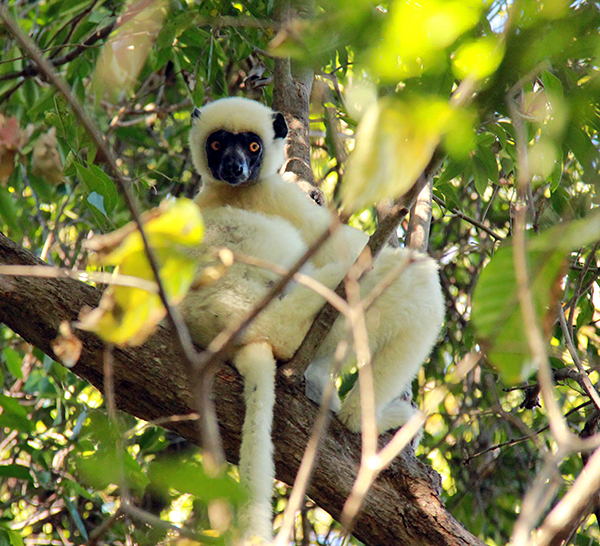 Sifaka lemur in the Tsingy. R. Zeilstra photo. Middle Jurassic limestones very rich in fossil corals. E. Petrides photo. 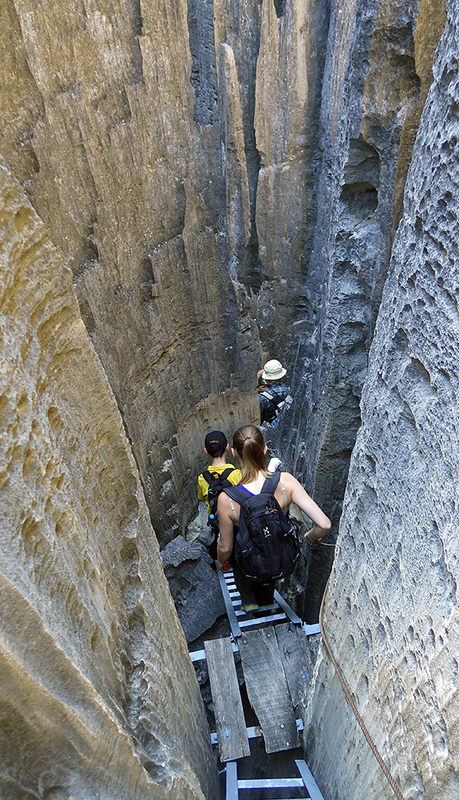 To enter to the big Tsingy you have to use long, very narrrow and deep cracks! M. Ng photo. Going down. J. Rakovan photo. In the big tsingy labyrinth. M. Ng photo. In the big tsingy labyrinth. E. Petrides photo. Spider on the wall of the cave. S. Szlinke photo. Time to start climbing. M. Southwood photo. To go to the top ladders are necessery. J. Rakovan photo. Climbing up. T. Praszkier photo. Going up. E. Petrides photo. Casper and surrealistic landscapes in tsingy. T. Praszkier photo. Go higher and higher. T. Praszkier photo. Finally close to the top. T. Praszkier photo. Tsingy stony forest. M. Yu photo. Tsingy stony forest. M. Ng photo. In some places to cross deep gorges we had to use hanging bridges. E. Petrides photo. At the hanging bridge. M. Southwood photo. At the hanging bridge, some of the cracks are up to 80 meters deep. E. Petrides photo. At the hanging bridge. M. Yu photo. At the hanging bridge. T. Praszkier photo. At the hanging bridge. T. Praszkier movie. Walking through the Tsingy is slow and difficult. N. Anstee photo. Mindaters at the view point. T. Praszkier photo. View to the Tsingy. T. Praszkier movie. Jeff Scovil on the top of the tsingy. E. Petrides photo. Taking photos. R. Zeilstra photo. 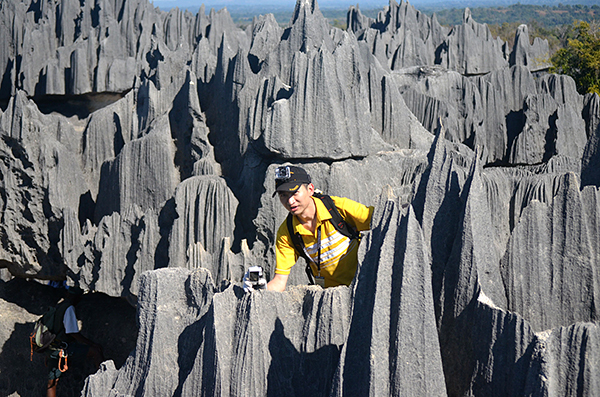 Stony forest of Tsingy. J. Rakovan photo. Stony forest of Tsingy. S. Szlinke photo. 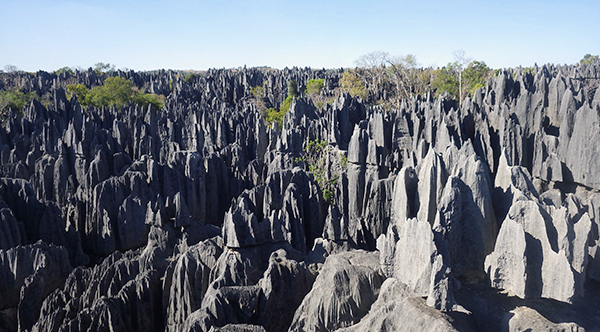 Stony forest of Tsingy. T. Praszkier photo. 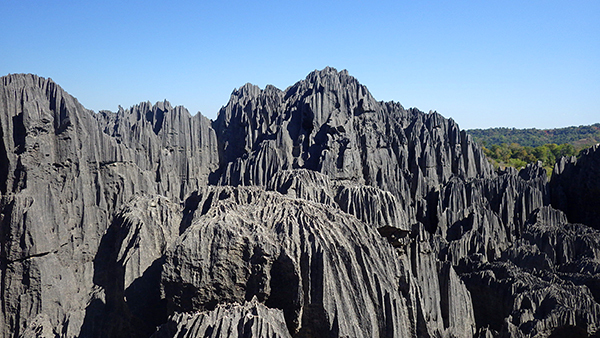 Stony forest of Tsingy. N. Anstee photo. Stony forest of Tsingy. E. Petrides photo. Time to go down. N. Anstee photo. Time to go down. E. Petrides photo. Some of as were in good mood ;-) M. Ng photo. At the evening in the hotel everyone was very tired, we had last briefing. M. Ng photo. Last photos in the last evening. M. Ng photo. These 6 people took part in all 3 Conferences: Poland, Morocco and Madagascar. K. Luk photo. Organizing team. K. Luk photo. 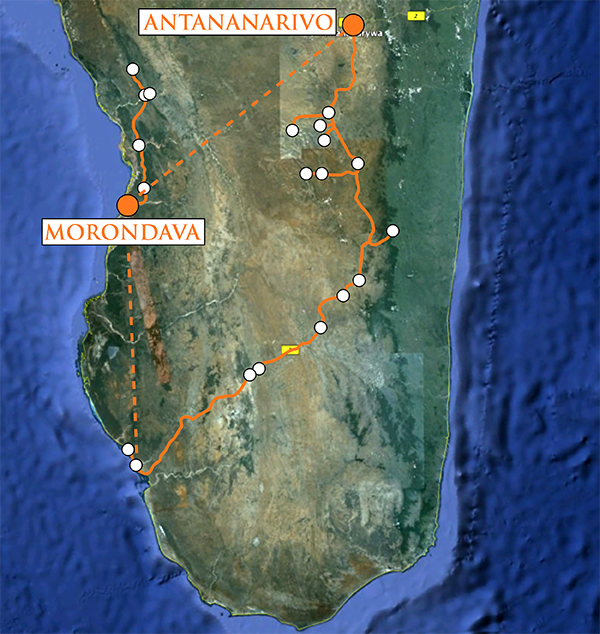 We had to start driving back to Morondava very early in the morning using the same bad roads, 2 ferrys etc. Google Maps. We started early morning. R. Lang photo. Crossing Manambolo river. E. Petrides photo. 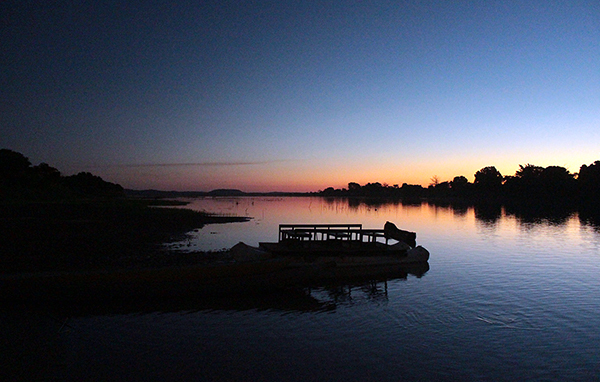 Manambolo river in the early morning. E. Petrides photo. Manambolo river early in the morning. J. Rakovan photo. When we were close to Morondava we still had some time so we decided to visit so called "baobabs in love". T. Praszkier photo. Souvenirs seller near the baobabs in love. E. Petrides photo. Some of us had the last beer on Avenue de Baobab. E. Petrides photo. Finally the end of the trip came, last speach and big applause to our drivers. 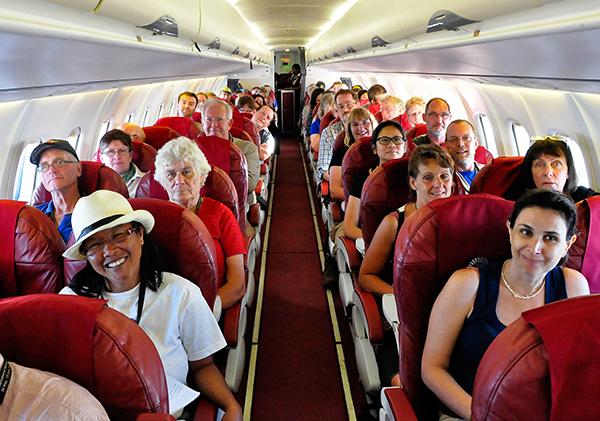 We took plane while they had to drive to the capital. E. Petrides photo. Going to our charter plane. T. Praszkier photo. Second Mindat flight. T. Praszkier photo. Tom taking photo of the Second Mindat flight. E. Petrides photo. Second Mindat flight. T. Praszkier movie. When we came back to Tana some of us had enough free time to visit the gemstone market again. E. Petrides photo. Temporarily our hotel changed into gemstone market too. E. Petrides photo. Temporarily our hotel changed into gemstone market too. M. Ng photo. You can see some other report from the conference here.